Im Abonnement enthalten ist ein kostenloser Online-Zugang zum aktuellen und zu allen seit 2007 erschienenen Jahrgängen. Zusätzlich können Abonnenten die kostenlose App 'Quintessence Journals' nutzen. Ziel dieser Zeitschrift ist es, wissenschaftliche Forschung und klinische Praxis zu verbinden. Der Schwerpunkt liegt deshalb auf Beiträgen, die klinisch relevant und dabei wissenschaftlich fundiert sind. Aktuelle Erkenntnisse aus der Forschung werden so präsentiert, dass sie für den Kliniker leicht verständlich und in der täglichen Praxis anwendbar sind. Alltägliche klinische Probleme finden dabei ebenso Beachtung wie Hilfestellungen zur Behandlung komplexer endodontischer Fälle. Darüber hinaus werden Beiträge zu den Beziehungen zwischen Endodontie und Parodontologie, Traumatologie, Kinderzahnheilkunde, Kieferorthopädie, Oralchirurgie, Prothetik und Implantologie vorgestellt. Die vierteljährlich erscheinende Zeitschrift wird im Peer-review-Verfahren begutachtet und von einem hochkarätig besetzten Redaktionsteam betreut. Publiziert werden wissenschaftliche Studien, Artikel zu klinischen Techniken und Behandlungsansätzen, Fallberichte sowie Beiträge zu neuen Materialien und Instrumenten aus der Dentalindustrie. • Mit kostenlosem Zugang zur Online-Version recherchieren Abonnenten komfortabel online - auch rückwirkend ab 2007 im Archiv. Objective: To assess the influence of root-end filling (REF) material on apical surgery outcome. Materials and methods: Cases of apical surgery performed in a private practice limited to endodontics, which had received Intermediate Restorative Material (IRM; Group 1) or mineral trioxide aggregate (MTA; Group 2) as the REF material were collected. Radiographic surgical healing at up to 12 months and 24 months was evaluated using agreed criteria by two trained observers. The results were analysed using the Pearson chi-square and Fisher exact tests, with the level of significance set at P < 0.05. Results: Twenty-two out of the 95 teeth were excluded for various reasons leaving a total of 73 teeth. Group 2 showed a significantly higher healed rate than Group 1 (81% vs 56%; P = 0.0189); however, the difference between 'healed' and 'healing' teeth was not statistically significant for both follow-up periods (≤ 12 months, P = 0.2852; ≤ 24 months, P = 0.1101). As a secondary observation, it was found that 'large' lesions (> 5 mm diameter) required a longer time to heal than 'small' lesions (48% vs 77%; P = 0.0147). Analysis of the REF material in relation to lesion size showed that MTA 'healed' rates were significantly higher for 'small' lesions than 'large' lesions (P = 0.0042), whereas with IRM, the difference was insignificant (P = 0.4217). Conclusions: MTA showed a higher rate of 'complete healing'. 'Large' lesions took a longer time to heal completely. 'Small' lesions had a higher 'healed' rate when MTA was used as the REF material. Elias, Michel K. / Soliman, Ahmed A. / El-Far, Hebatallah M. / Ghoneim, Angie G. / Gawdat, Shaimaa I. Objective: Postoperative pain has been thought to vary according to the instrumentation kinematics. The aim of the present trial was to compare the incidence and intensity of postoperative pain after using Reciproc or One Shape nickel-titanium systems for root canal instrumentation. Materials and methods: One hundred and eight patients with symptomatic irreversible pulpitis were assigned to two groups according to the root canal instrumentation technique, Reciproc (VDW, Munich, Germany) or One Shape (Micro Méga, Besançon, France). Treatment was completed in a single visit. At the end of the visit, participants were asked to rate the intensity of postoperative pain on the numerical rating scale at 6, 12, 24, 48 and 72 hours. Participants were also given ibuprofen 400 mg to be taken in case of intolerable pain and asked to record the number of analgesic tablets taken at these time points. Mann-Whitney test was used to compare between two groups in non-related samples. Friedman test was used to compare between more than two groups in related samples and Wilcoxon signed-rank test was used to compare between two groups in related samples. Results: A statistically significant difference was found in terms of incidence of postoperative pain at 12 hours (P = 0.034) and 24 hours (P = 0.04) postoperatively, with less incidence of pain in the One Shape group compared to the Reciproc group. No differences were found in terms of the intensity of postoperative pain or the analgesic intake at the assessed time points (P > 0.05). Conclusions: Continuous rotary instrumentation was accompanied by a significantly lower incidence of pain at 12 and 24 hours postoperatively compared to reciprocation. The intensity of postoperative pain and analgesic intake were similar in both groups. Objective: Glide path preparation has been recommended as a mandatory clinical step to ensure the safe usage of nickel-titanium (NiTi) rotary instruments. This study aimed to evaluate the incidence of fracture of ScoutRace, ProGlider and One G files when used to mechanically negotiate curved canals. Materials and methods: Seven files from each brand were used to mechanically negotiate mesial canals of extracted human mandibular molars with root canal curvature angle ranging from 25 to 40 degrees. All rotary files were used until fracture occurred. The number of canals that were prepared and the total active instrumentation time for each file till fracture were recorded. Data were scored and statistically analysed using Kruskal-Wallis and Mann-Whitney tests (P ≤ 0.05). Results: One G had a significantly higher number of negotiated canals till fracture when compared with ScoutRace (P < 0.05), and no significant difference when compared with ProGlider (P > 0.05). The difference between ScoutRace and ProGlider was not significant (P > 0.05). ScoutRace recorded the highest incidence of fracture, followed by ProGlider and One G. There was a statistically significant difference between ScoutRace and ProGlider (P < 0.05), as well as between ScoutRace and One G (P < 0.05) regarding their total active instrumentation time till fracture, whereas there was no significant difference between ProGlider and One G (P > 0.05). Conclusions: Under the limitations of this study, the One G file appeared to be suitable for safe and efficient glide path establishment, followed by ProGlider and ScoutRace files. 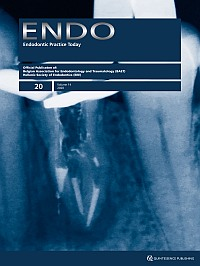 Objective: This study assessed the push-out bond strength (POBS) of an epoxy resin-based sealer in oval-shaped root canals after a final irrigation protocol using XP-endo Finisher and ultrasonic activation. Materials and methods: Thirty oval-shaped human root canals were prepared with Reciproc R25 and a final irrigation regimen using 5.25% sodium hypochlorite and 17% ethylenediaminetetraacetic acid (EDTA) was performed. The teeth were divided into three groups (n = 10) according to the final irrigation activation technique: no activation (control), ultrasonic activation and XP-endo Finisher activation. Specimens were filled only with AH Plus sealer and the POBS test was used to measure the bond strength between the root canal dentine and AH Plus sealer. The data obtained from the POBS test were analysed using two-way analysis of variance and Tukey post-hoc tests (P < 0.05). Results: The POBS values decreased from the coronal to the apical direction (P < 0.05). There was a significant association between the activation technique and the root canal third (P < 0.05). In the coronal and middle third, XP-endo Finisher and ultrasonic activation showed higher POBS than the control group (P < 0.05). In the apical third, XP-endo Finisher showed higher POBS than ultrasonic activation (P < 0.05) and the control group (P < 0.001). Ultrasonic activation also showed higher POBS values in the apical third when compared to the control group (P < 0.05). Conclusions: The activation of root canal irrigants influenced POBS of root canal sealers in the different root thirds of oval-shaped canals. The use of XP-endo Finisher file resulted in better POBS than ultrasonic activation in the apical third. Objective: This study evaluated the effect of various endodontic irrigation regimens, using NaOCl followed by different agents for smear layer removal, on the surface and interface of Biodentine with dentine. Materials and methods: Furcal perforations were produced in 60 permanent mandibular molars. The walls of the perforated area were contaminated with blood and then perforations were covered with Biodentine and the teeth were divided into six groups (n = 10). In the control group, all irrigation procedures were performed using distilled water. In the other five groups 5.25% NaOCl was used as initial irrigant followed by: distilled water (DW group); 17% ethylenediaminetetraacetic acid (EDTA group); 37% phosphoric acid (PA group); 10% citric acid (CA group); and 7% maleic acid (MA group). The specimens were analysed using scanning electron microscopy (SEM) before and after the irrigation procedure to evaluate the morphology of Biodentine on the surface. SEM images were analysed qualitatively using a score system (Score 0, no modification between initial and final images; Score 1, modification between initial and final images). Push-out bond strength test was performed 7 days after sample preparation. Data were statistically analysed using Kruskal-Wallis and Dunn tests (P < 0.05). Results: All irrigation regimens modified the topography of Biodentine. The regimens that used NaOCl/DW and NaOCl/EDTA showed significantly lower push-out bond strength values when compared to NaOCl/PA, NaOCl/CA, NaOCl/MA and control (P < 0.05). Conclusions: The regimens using NaOCl/DW or NaOCl/EDTA compromised the push-out bond strength results when compared with other groups. Purpose: Gentlefile (GF) is a newly developed stainless steel rotary system claimed to have superior shaping ability compared to nickel-titanium (NiTi) rotary systems. The purpose of this study was to compare the incidence of the canal transportation and centring ability of ProTaper Next (PTN) and GF rotary systems. Methods and materials: Thirty-two mesiobuccal root canals of mandibular molars with an angle of curvature ranging from 25 to 45 degrees were randomly divided into two groups of 16 canals each according to the instrument used for preparation: PTN or GF files. Cone beam computed tomography (CBCT) was used before and after preparation of the samples to assess the amount of canal transportation and centring ability at 3, 6 and 9 mm from the apex. Data were scored and statistically analysed using independent t test. The significance level was set at P ≤ 0.05. Results: The GF system produced more canal transportation than the PTN system at 3 and 6 mm with a statistically significant difference (P ≤ 0.05), whereas at 9 mm there was no statistically significant difference between the two systems (P ≤ 0.05). PTN showed better centring ability than the GF at 6 mm and this difference was statistically significant (P ≤ 0.05). However, at 3 and 9 mm there was no significant difference between the two systems (P ≥ 0.05). Conclusions: Under the limitations of this study both systems produced canal transportation but the PTN system resulted in better root canal preparation with a lesser degree of canal transportation and better centring ability than the GF system. Objectives: The aims of this study were to provide a detailed cone beam computed tomography (CBCT) analysis of C-shaped root canals in mandibular second molars from a southern Indian population of Tamil Nadu state and to evaluate their cross-sectional characteristics and periapical radiograph appearances. Materials and methods: In total, 758 patients referred for root canal treatment of mandibular second molar teeth were included in this study. From this, 53 individuals with C-shaped canal anatomy had their 57 teeth subjected to CBCT scans. Differences in prevalence of different types of C-shaped root canal configurations at three different axial levels and their periapical radiograph appearance between genders and ages were compared using chi-squared test. Results: The prevalence of C-shaped canal in mandibular second molars was 7%. Gender difference was significant (P < 0.05) with females (38 individuals, 9.1%) having higher incidence compared to males (15 individuals, 4.4%). In 68.4% of teeth the canal configuration changed along the entire length of the root. Radiographic assessment indicated that 43 teeth (75.4%) had a fused root appearance and 14 (24.6%) had two separate roots. Conclusions: The C-shaped canal anatomy presentation varies greatly along the length of the root, which leads to considerable difficulty in debridement and filling of this root canal system. Canal morphology presentation of the population group in this study differs considerably from other studied population groups. Radiographs from one angle will not be adequate to detect the C-shaped canal. CBCT is a clinically effective tool in aiding the understanding of the canal morphology of a C-shaped canal system. Following a definitive diagnosis, management of invasive cervical resorption (ICR) usually requires multiple steps to eliminate this pathosis. These may include the surgical isolation of the defect and removal of the fibrous, clastic cellular-based resorptive tissue, use of a high concentration of an escharotic agent to eliminate resorptive channels of the invasive pathosis that burrow deeply into the tooth structure, root canal treatment and a proper restoration, using a biocompatible resin-based material. This approach has been shown to be widely acceptable in many cases of ICR. The effectiveness of eliminating the invasive process depends greatly on the safe and judicious use of the escharotic agent, namely 90% trichloroacetic acid, which may also cause damage to the adjacent healthy tissue if not used properly. This case report addresses the use of a lower concentration of trichloroacetic acid in an attempt to safeguard the adjacent tissues in the presence of a significant ICR defect, with a positive outcome being noted.